This is Papa Roach’s first album for a new record label and something of a middle finger to Geffen who recently released a 'Greatest Hits' compilation, pretty much against the bands wishes. 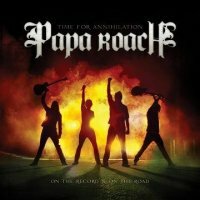 The Papa Roach sound has certainly developed from the 'nu-metal' debut back in 1999 to something with a more mainstream rock idiom, and I've loved all the recorded output since 'Getting Away With Murder' in 2004, though I thought 'Metamorphosis' as a whole paled in comparison next to the excellent 'Paramour Sessions'. 'Time For Annihilation' features 5 brand new songs as well as a selection of classics recorded live on the last tour with Halestorm and Shinedown. Each new track eclipses anything from 'Metamorphosis', which could either be as a result of the involvement of both drummer Tony Palermo and producer David Bendeth (who pretty much acts as a fifth band member) in the writing process, or a new sense of creativity from everyone. 'Burn' is an instant monster featuring a fist in the air hook and would be a storming show opener, whilst 'Kicked In The Teeth' is a snot-nosed punk/pop fuelled bruiser of a song dripping in attitude, with another memorable chorus and already a favourite. The gang vocals and production simply add to the anthemic feel to the proceedings, daring you not to join in no matter where you are or what you are doing (perfect for doing the housework to). An early surprise comes in the form of 'No Matter What', a mid-paced semi-ballad built on a restrained musical framework, featuring a gloriously melodic performance from the band, an almost subtle Shaddix vocal and showcasing a significantly mature writing ethic. Both 'One Track Mind' and 'Enemy' reinvent the regular P Roach sound without losing any signature identity and it would be hard for me to imagine any show now without any of the new songs as an integral feature. 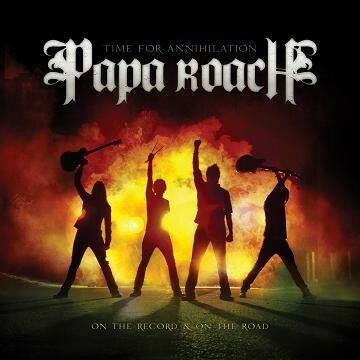 The live portion of the CD includes 'Getting Away With Murder', '...To Be Loved', 'Lifeline', 'Forever', 'Time Is Running Out' and 'Scars' and is a perfect example of how energetic Papa Roach are in front of a crowd. Jacoby Shaddix has a knack of inducing rapturous audience involvement though some of his between song banter could lead to those of a politically correct persuasion needing a lie down. 'Between Angels and Insects', 'Last Resort' and 'Dead Cell' nod their head in the direction of the band's original musical roots yet fit in with the more recent material seamlessly. Currently available in two formats, both at budget prices, 'Time For Annihilation' is an excellent value for money package and on reflection I would have purchased the CD for the new songs alone (yes they are that good). The fan pack comprises a demo version of 'No Matter What' (which actually works really well in a stripped back acoustic format) and a bonus DVD including the 'Kicked In The Teeth' promo, performance videos and a short interview montage which lasts around 6 minutes. Can I just warn those of a nervous disposition that Papa Roach sound hungrier than ever and I'm surprised that a parental advisory sticker wasn't included on the front of the CD booklet.....though I know the kids love a little bad language. I for one cannot wait for the 'Taste Of Chaos' shows in December and the next full length album!